If someone is confused about what proper Techno is, I play them Game One. does anyone know in what Voorn's contribution to Game One consists? Game one is a top track from Juan, you can hear the european influence on his Detroit groove for sure, it works well though. Great danceable beat with a lush deep piano type sample, great stuff. Think Quick is a bit more laid back and trippy, pure detroit techno, love it. Don't normally go for coloured vinyl, but the quality is good on this pressing. 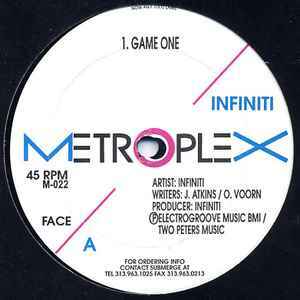 Game One is an absolutely stunning tune from Infiniti. Energetic but intelligent, it's pure techno in one complete package. Definitely one of the all time favourites. A genius timeless production of the godfather of techno himself.